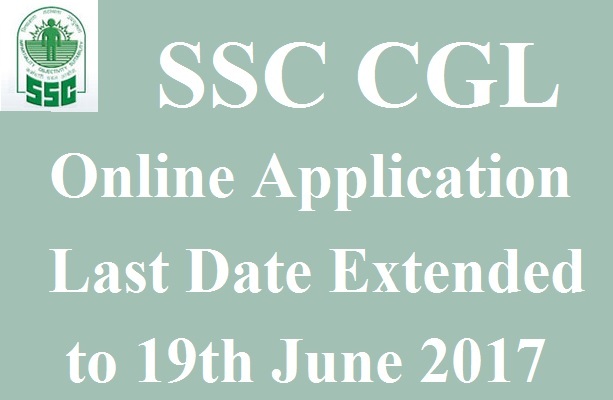 SSC CGL Last Date Extended: Staff Selection Commission has extended the SSC CGL Last Date. Candidates can apply online for Combined Graduate Level Examination on or before 19th June 2017. The SSC board is going to conduct the graduate level exam from 1st August to 20th August. Due to heavy traffic, some students faced server down issues while applying for SSC CGL Exam. Staff Selection Commission has released the notice on its official website regarding the extension of time to fill the application form. Download SSC CGL Last Date Extended PDF from the official website ssc.nic.in. Candidates are advised to start the SSC CGLE 2017 Registration as early as possible. Go to the official site ssc.nic.in and complete the registration process. Fill the SSC CGLE 2017 Online Application Form and submit it on 19th June 2017 before 5 PM. The Commission has extended the SSC Combine Graduate Level Last Date because from the past two days applicants are facing technical problems. Staff Selection Commission which is abbreviated as SSC was established in the year 1975. It releases the notification for various posts every year and conducts exams in the month of August. SSC CGL Exam will be conducted in four stages. Now it has extended the SSC CGLE 2017 Registration Date and invites applications from aspirants until 19th June 2017. Applicants, who have generated the bank challans before 5 PM on 19th June, can make their payment by 21st June 2017at any one of the branches of SBI. Direct and active link of SSC CGL Exam is provided at the bottom of our page. Follow our website www.Techfactslive.com on Facebook & Twitter to get all the latest updates regarding SSC CGL Admit Cards and Results. If you have any Problem Contact us at [email protected].